EASTERN GHOUTA/Syria/, March 13. /TASS/. The first of two groups of nearly 100 civilians has left a town in Eastern Ghouta, a Damascus suburb, through a humanitarian corridor towards a checkpoint in al-Wafedin, the chief of the Russian Center for Reconciliation of the Warring Parties said. "After talks between the Center for Reconciliation of the Warring Parties with the leaders of illegal armed groups in Eastern Ghouta, an agreement was reached on the evacuation of two groups of a total of 100 civilians from Douma to a checkpoint in the settlement of al-Wafedin. There are wounded persons among them," Yuri Yevtushenko said. This is the third major organized evacuation of civilians from Eastern Ghouta. Earlier 52 people left Misrab, and then 76 people were evacuated from another settlement of Dubai. Chief of Russian General Staff and First Deputy Defense Minister Valery Gerasimov said more than 1,000 militants and civilians are expected to be evacuated from Eastern Ghouta. "In line with an agreement with militant leaders, today there are plans to evacuate more than 1,000 militants and civilians from the Douma area," Gerasimov told a meeting of the Russian Defense Ministry. Despite the repeated attempts by militants to undermine peace initiatives in Eastern Ghouta, the situation there is stabilizing, he said. Since the United Nations Security Council’s Resolution 2401 entered into force on February 24, 2018, some 145 civilians and 13 members of the armed opposition have been evacuated from Eastern Ghouta through a humanitarian corridor set up by Russia. Some 76 of them left the area this night. According to Gerasimov, tensions are running high in Eastern Ghouta. "Terrorists and affiliated groups of the so-called moderate opposition are holding civilians hostage using them as a "human shield." They quash any protests of citizens in Eastern Ghouta who are banned from leaving this area under penalty of death," he said. "The militants’ fire has killed 15 and wounded 133 civilians only over the past month," Gerasimov said. Terrorists and affiliated groups of the so-called moderate opposition are holding civilians hostage using them as a "human shield," he said. They quash any protests of citizens in Eastern Ghouta who are banned from leaving this area under penalty of death. On Monday, the terrorists gunned down four people and wounded another 10 during the dispersal of demonstrations in Hammuria. 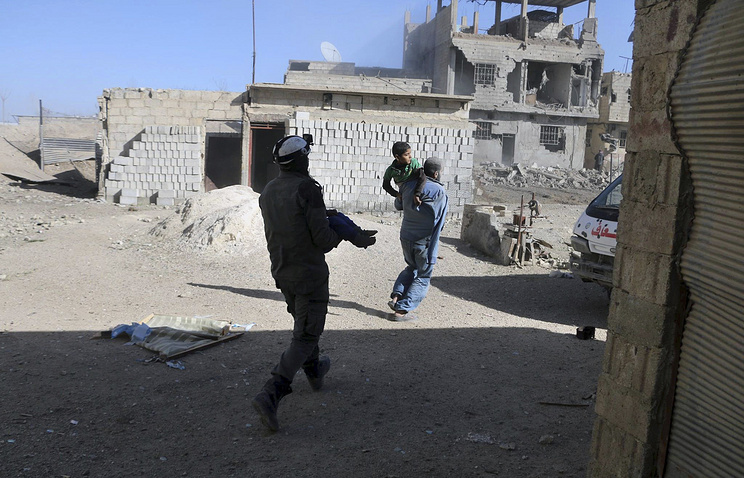 In another town of Kafr Batna, five civilians were killed and 12 others were wounded.